Incredibly these two photos are of the same rider, just three years apart. Robyn Stewart switched from hockey and is now riding the Commonwealth Games for Northern Ireland. Currently preparing to get into action at the Commonwealth Games, Irish sprint star Robyn Stewart has had an incredible journey to the Gold Coast. She is now a seasoned international rider, with national records achieved and having carved her name into the history of the Irish cycling. But she has, literally, come from nowhere; in cycling terms at any rate. Four years ago the Commonwealth Games were in Glasgow. Belfast’s Stewart was there, but as a spectator. She was playing club hockey at the time and went along to watch some of those matches. Less than 12 months earlier she had married Team GB track cycling coach Kevin Stewart. And at the 2014 Commonwealth Games her brother-in-law, British cyclist Mark Stewart, was competing on the track for Scotland. Stewart, then 24-years-old, went along to the Sir Chris Hoy Velodrome in Glasgow’s East End to watch him in action. It was then that the first sparks of an idea began. 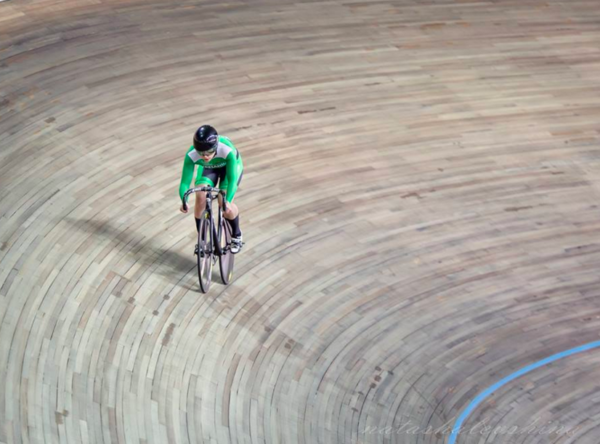 What if she put away her hockey stick and took up a track bike instead? Could she get the hang of it? Would she be any good? It was a dream, but might she get to the next Games in four years time? Those questions have since been answer; very much in the affirmative. 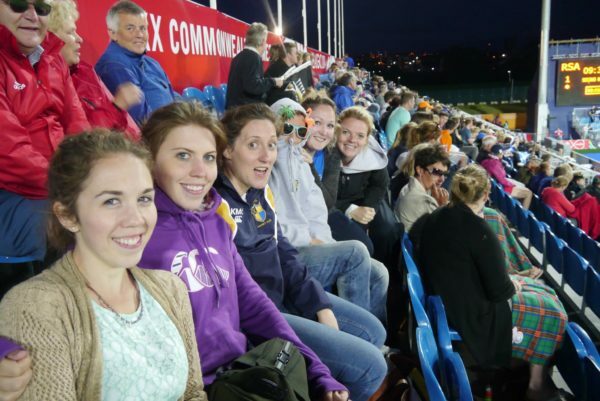 Watching the hockey (in purple hoody) at the Commonwealth Games four years ago and playing hockey herself around the same time. After a whirlwind affair with track cycling, on Tuesday night Robyn Stewart got to savour the electric atmosphere of Carrara Stadium on Australia’s Gold Coast for the opening ceremony of the 21st Commonwealth Games. But unlike four years ago, she wasn’t in the crowd, but marching around the track representing Northern Ireland with 88 athletes from 13 different sports. And tomorrow, Friday, she takes part in the women’s sprint. She told stickybottle she recently came across the photos of herself riding the track, above, and the change in her physic reminded her how far she had come. Of late she has reduced her work life, as a dentist, to just one day per week. And she has used her time to get into the shape of her life. And, as usual, she has made those final preparations under the experienced and watchful eye of British Cycling sprint coach and husband Kevin. 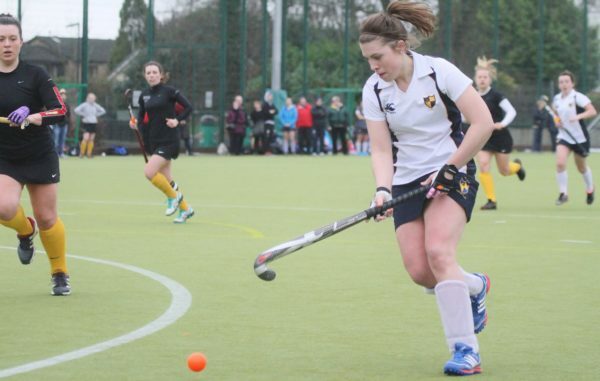 It’s a long way from her hockey days with Hillhead Ladies Hockey Club in Glasgow or playing soccer during her time at Dundee University. But it’s a journey that’s been as enjoyable at it has been rapid. And though reaching the Commonwealth Games is an incredible achievement for any athlete, especially someone only cycling properly three years; she sees it as a stepping stone along the way. She wants further improvement and bigger things in the future. “From day one when I told my hockey team I was going to put my hockey stick away and commit to cycling I’ve followed a program and taken myself far too seriously,” she said. “It was hard not to treat it like I had been doing it a long time when my husband’s job is to coach and write sprint programs. “So I was thrown in from day one with a training plan. Kevin initially thought my change to cycling was a mad phase – especially because I was so, so terrible for the first few months. “I guess it’s a mad phase that I’m still on. I’m constantly striving to train harder, to get bigger, stronger and faster. “And I’m nowhere near where I want to be. But it’s so funny to step back and look at the change in the three years that I’ve been committed to cycling; even my change in focus and goals. “I found this old photo from one of my first sessions on the bike and I realised I had a recent one to compare to; the change is mad,” she said of the image at the top of this story. 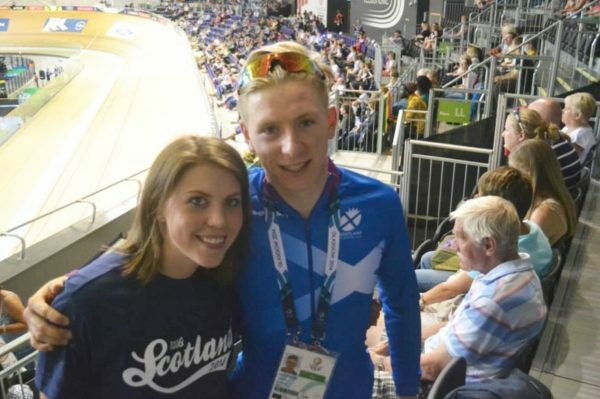 With brother-in-law Mark Stewart at the last Commonwealth Games four years ago when he was riding and she was watching on. And riding in the green of Ireland. Weak and slow are not words that now fit with even a hint of credibility into any sentence that includes the name Robyn Stewart. Without fear of exaggeration, she has blazed a trail for Irish women’s sprinting; with records and several important firsts for Irish female sprinting. Shannon McCurley, of course, is our other fast woman. But the Australian-based Irish Olympian’s speciality is the keirin rather than the sprint. And so Stewart is writing a new chapter for Irish female sprinting. She holds the 200m, 500m and team sprint national records; lowering those markers multiple times. She has been the first Irish woman to ride the sprint at UCI World Cups, the European Championships and at the World Championships; the latter in Holland in February. She is currently a four-time national champion; in the 500 metre TT, sprint, keirin and team sprint. But while she has excelled on the boards, switching from the team dynamic of soccer and hockey to the individual sport of track cycling was not easy. “I didn’t start cycling initially thinking I would be doing what I am now,” she said. “I certainly had no initial intention of setting my career to one side and spending all my money on bike trips and equipment. But I got too much of a bug. “I was inspired after watching the Commonwealth Games four years ago and how absolutely fun it looked. I started because I loved it; the thrill from going fast and trying really hard. “Of course I’d always dreamed of being a professional athlete; that was my dream as a kid. “In truth I wanted to be the girl from ‘Bend it like Beckham!” she joked of her early soccer days. “But from very early on as a cyclist I had a goal of wanting to get better and better. And every time my times improved I wanted more. And so it goes on. She said a huge change when she started cycling was the strength training. She has gained weight and she has become more powerful. “Although I played hockey for years, l never did any weights work,” she said. “We would practice skills and train a few times a week. And the rest of the time I spent trying to improve my fitness. So it was mostly running and interval sessions. “Almost immediately when I started lifting weights, combined with riding a bike, my body changed shape. “Initially I leaned up a lot and probably lost weight. Then as time went on and I lifted heavier and started to sprint, I gained a fair bit of muscle. “So I hope the 6kg I’ve put on in three years is mostly muscle but I don’t have exact figures. If I have gained fat it is hard to say. The Stewarts are based in Manchester, where Kevin is part of the Team GB set-up. And it’s there than Robyn has turned herself into a powerhouse, working constantly in the gym. “Although I didn’t start riding when I lived at home, the track has dictated where Kevin and I have lived for the past five years because he is a sprint coach. For now though, Stewart has the not-so-small matter of adding the Commonwealth Games to her incredible list of achievements. After the Gold Coast she is hungry to get stronger and faster. Where that takes her, only time will tell. But her hunger is strong and Tokyo 2020 is now coming into view.